Another trip to Chicago is in the books and we had a great time! Despite the bad weather at the start of the convention things went very well. For those that didn't know, there was widespread flooding around Chicago. It caused numerous travel delays for out of town attendees and I head more than one horror story from locals trying to balance playing Adepticon and getting several feet of water of their basements. No matter what mother nature threw at the folks at Adepticon, they threw a great con and I want to thank them for that. The swag bag again was full of great things. 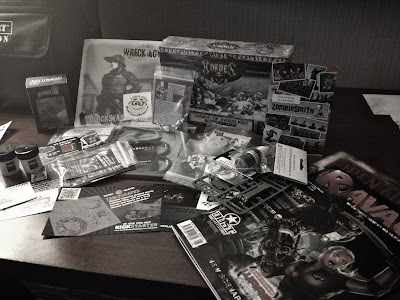 Some new cool miniatures to play around with as well as plenty of things to read and explore. This model from Victoria Miniatures is definitely going into my Chaos Space Marine army. Those cultist are going to need a new boss to lead them around the battle field. 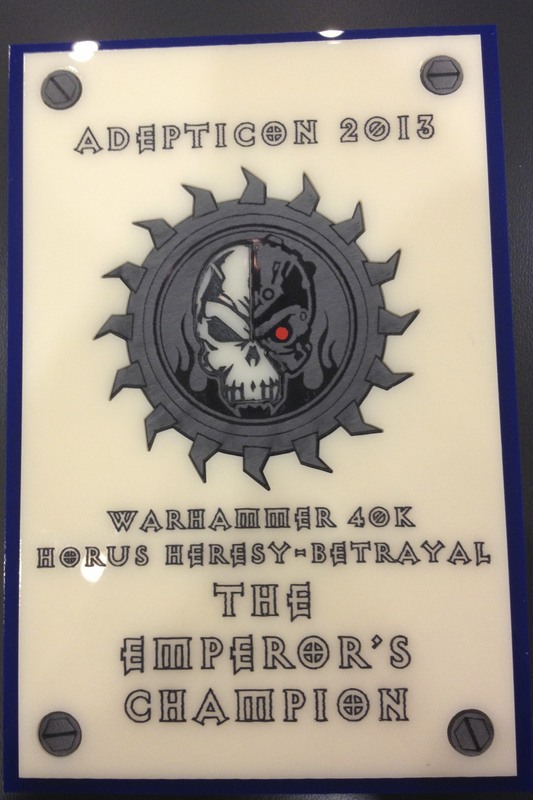 This year is also the year that I got my first major award- The Emperor's Champion in the Horus Heresy Betrayal tournament! So how about that!?! I think it deserves a free re-roll once per game. I have plenty of more pictures to share from Adepticon including my Horus Heresy Death Guard, some Nurgle Space Marines, and some Team Tournament love. But first it is time to get some sleep, because didn't have much in Chicago! And hey, what did you get from Wreck-Age? PS - I'm so freaking jealous....... AHHHHH!!!! That Chaos Goat dude is badass. I didn't end up getting much rom Wreck-Age. There is a starter book in the swag and if you played a demo you got a free model. One of the other guys got the model which looked cool, but that is all that recall from it! 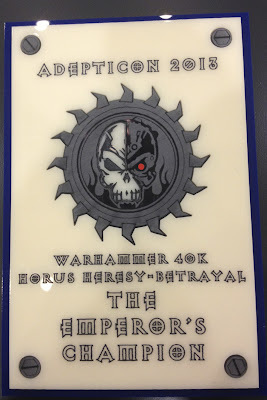 Sadly, it was another weekend filled with nothing but 40K for the whole weekend. While that isn't a bad thing, it doesn't allow for much time to play other games/demos, etc. The chaos goat from Victoria miniatures is pretty awesome. Chaos cultist all the way. I got a box of her models as prize support, I'll post those later.